I am a member of the Collective Bias® Social Fabric® Community. This shop has been compensated as part of a social shopper amplification for Collective Bias. Amazon and I are very close. I shop and sell on Amazon quite frequently. When I learned about their new collaboration with Twitter, I was beyond excited. Seeing two online powerhouses team up to create something innovative just makes me happy. Shopping on Amazon was already easy, but this Twitter system makes it even easier. How it works is quite simple. Say you are just strolling through your Twitter feed checking things out and you happen to see a product that you would really like. 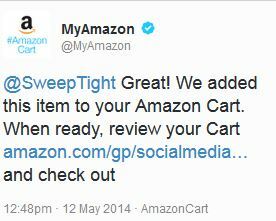 If the tweet contains a link to amazon, just reply to that tweet using the hashtag #AmazonCart. Watch this video for more info. Ooh look, pen cap utensils… I need to investigate them later! Of course, I felt the need to express my feelings for the product in my tweet, but it works if you only put the hashtag with no additional text, as well. I used #AmazonCart #cbias for the purpose of this project. 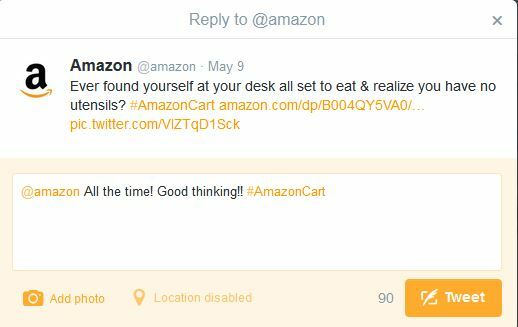 Amazon will tweet you back with a confirmation that the item has been added to your cart. The product will be sitting in your cart waiting for you to follow up at your convenience. This doesn’t mean you are locked into purchasing the item. Once it’s in your Amazon cart, you can move it to your wishlist, checkout, or simply delete. This might sound like a silly feature, but I appreciate it. There have been many times when I am tweeting from my phone or other device, and cannot easily jump to another window. If I jot something down on a sticky note, who knows where that will end up. Chances are good that I will forget what it was that caught my eye. This way, a quick tweet will add it to my account and I can reevaluate the item later to decide if it’s something I really want or not. Since I am an Amazon Prime member my items will arrive in two days or less. I don’t know how they do it, but I have even gotten my items in one day at times – LOVE Amazon Prime. After all my tweets using #AmazonCart, I ended up ditching the pen cap utensils and kept these other gems. This is just a little too fun for me! Being a big Twitter-er, this also gives me the opportunity to easily share Amazon products with my followers. If I want to share something awesome, I just have to tweet out a link to the product on Amazon. If anyone wants it, they just reply using the hashtag #AmazonCart and bam, it will be in their cart. I literally just recommended a book to a friend the other day using an Amazon link. She could have saved herself a step or two had she known about this method! Another time that I can see this as being useful is during Twitter Parties. Many times cool products are mentioned, but you don’t want to step away from the high-paced Twitter party feed. 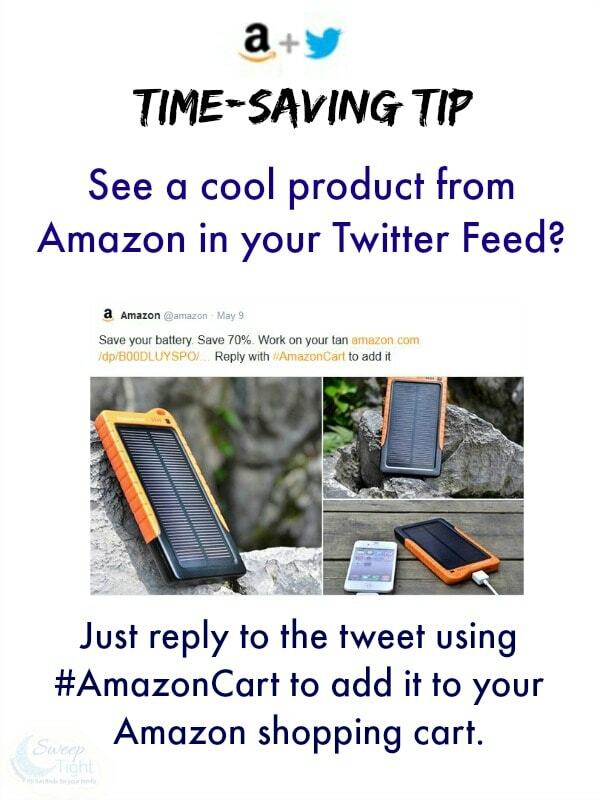 A quick tweet and that product will be in your cart. Don’t miss a thing during the party! Amazon has a whole lineup of Twitter handles to follow so you can start seeing their products in your Twitter feed. Just keep an eye out for any links to amazon in tweets. Those are the ones that this feature will work with. What are your thoughts about #AmazonCart? I don’t have a smart phone and don’t pay that much attention to what’s on twitter so I don’t think this will be of much use to me. genious idea! 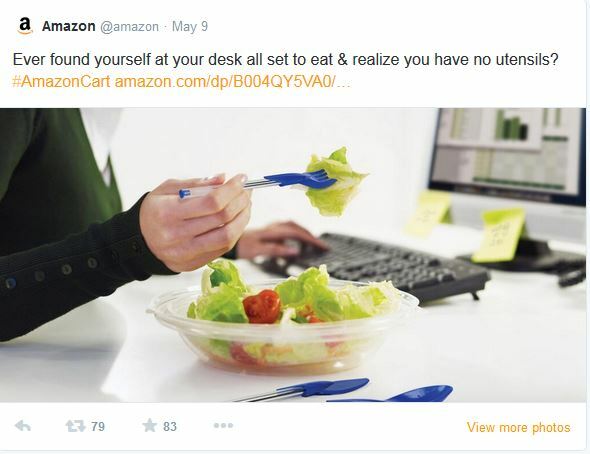 i need to follow amazon on twitter now. That is such a cool idea!! I’m going to be stalking twitter and will try this! Hahah how neat! That pen/fork idea is so neat and the banana slicer. I love me some AMazon!! I was already totally IN LOVE with Amazon…and now the romance is even stronger 🙂 They make my life so easy and happy – I can not wait to try this. WAY easy to add things to my Amazon cart via twitter!! Since I have a tendency to get distracted easily, this is brilliant for me to quickly save it to the cart and carry on with my madness. This looks awesome! We love to shop with Amazon. How interesting! It will be fun to watch it grow! We love Amazon, so easy to use and great prices. Wow this is neat. I shop on Amazon all the time. Definitely need to try this. I think this new service is so super cool!!! 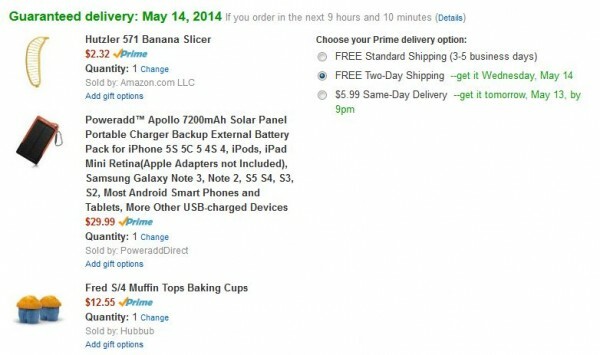 I am tempted to add the banana slicer to my cart!! I actually tried this already and think it’s a really neat way to shop. I spend a lot of time on Twitter so it’s great. I never heard of this before today. What an interesting idea! That is so incredibly cool! I’m excited about Amazon’s same-day shipping they just added in phoenix! One of my favorite places to shop, I am so going to have to check this out! This looks really cool. I already loved shopping with Amazon, this only makes it better. I love this concept! It would definitely make it easier to shop…now i need to get more active on Twitter to take advantage of it. lol. I love shopping at Amazon! This concept would definitely make shopping easier. That is crazy that you can add something to your Amazon Cart that easily! Very cool! This is a very good way for me to shop on Amazon. I will have to give it a try and see how I like it. You gave great detailed description on how to use Amazon Cart. This is NOT good for me to know 🙂 I love Amazon and anything that slows me down in my purchasing is a good thing 😉 Actually I love this. Also, love the utensil ends for the pens. Brilliant! !